Last week, when Sprint announced that it was laying off 4,000 employees, we suggested that Apple’s iPhone was killing off those jobs. A lot of people took issue with the suggestion, saying that Sprint’s lousy customer service was to blame. Sprint’s customer service IS terrible. We used to be Sprint subscribers, and found that going to our local Sprint store was a complete hassle. When we decided to switch carriers, they told us we wouldn’t get hit with a cancellation fee and then they billed us with a cancellation fee. But there’s more to Sprint’s declining fortunes than bad service: Apple’s iPhone and AT&T’s iPhone service are a leap forward, and Sprint customers are switching providers as a result. According to a recent survey, subscribers from Sprint and T-Mobile are the most likely to say they would switch providers to get the iPhone. About 12.5 percent of T-Mobile customers and 8.1 percent of Sprint customers surveyed expressed a high interest in the iPhone. AT&T said Thursday that fourth-quarter earnings rose over 61 percent, helped by the addition of a record 2.7 million wireless customers, many of which are believed to have switched to the provider as a result of Apple’s iPhone. Sprint is cleaning house, getting rid of their CFO, CMO & President of Sales & Distribution, because they’ve failed to compete effectively with the AT&T/Apple combo. You can’t attribute all the 4,000 jobs cut at Sprint to pressure from the iPhone. Sprint has been giving customers a lot of reasons to consider other carriers. Nevertheless, it’s clear that the iPhone is increasing the pressure on Sprint, by providing a friendly alternative to the phone industry’s status quo. 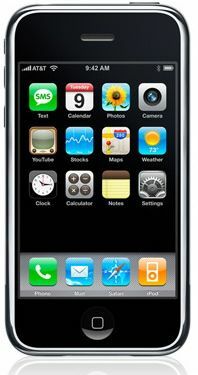 I have T-Mobile but will change in a heart beat when the next generation of iPhone is released. No kidding – I’m wanting an iPhone bad too, but I’m stuck in a contract for another f’in year. Speaking of heartbeats, I’d drop Comcast in one if Sprint’s Xohm becomes available in my area. Eric – I read that too, but wasn’t too impressed. The article is basically speculating about the difference between Apple’s sales figures in January and Sprint activations at the end of December. In other words- did Apple hit a home run, or did they hit it out of the park with the bases loaded? What carrier do you think AT&T & Apple are stealing customers from? Well, I don’t think anybody “steals” customers: You either win them or you lose them. I’ll concede that Sprint is *losing* customers to AT&T at a pretty high rate compared to other companies, but that’s not the iPhone’s “fault.” The iPhone may attract an unsatisfied Sprint customer’s eye, but it’s Sprint’s own record that’s doing them damage. I still contend that if Sprint was a superior service they wouldn’t be laying people off, and it is for that reason, over and above the attraction of the iPhone, that the responsibility lies with Sprint and not Apple. I don’t really think so. Check out this site – http://www.iphonefreelancers.com – They have hundreds of specific iphone Jobs – both fulltime and contract. So, there are plenty of jobs to go around.